Feel the best version of you with nutritious meals made from the finest ingredients. Age should never be a barrier to looking and feeling fantastic. 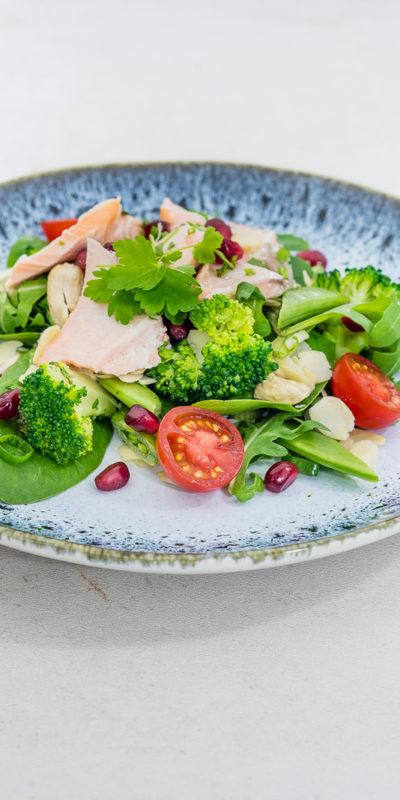 This programme is rich in antioxidants and high-quality proteins, whilst excluding refined sugar and dairy to reduce inflammation, which can help to slow down the ageing process. It is packed full of probiotics to support gut-health which is central to promoting health and radiance. This programme is designed to facilitate sustainable weight-loss or weight-maintenance without feeling deprived or hungry and is nutritionally tailored to support hormonal health. Free-range eggs served on organic rye bread. Eggs are a convenient source of protein and are rich in vitamins and minerals. Pineapple contains an antibacterial enzyme called bromelain, which has anti-inflammatory properties. Spiced butternut squash salad served with quinoa, chickpeas and a raspberry dressing on a bed of fresh leaves. Mediterranean inspired dip made with butter beans, mixed herbs and anchovies. This dip is served with red pepper and celery batons. Miso marinated cod fillets served with wild sesame rice, kale and carrot stir fry. White fish is a lean protein providing amino acids to rebuild and repair cells.